In 1904, at an estate auction, the National Museum of Scotland purchased a harp said to be given to Beatrix Gardyne of Banchory by Mary, Queen of Scots, in 1563. While no one can ascertain the truth of this tale, the instrument is thought to have been decorated at one time with a portrait of the queen. The museum’s collection of items associated with Mary also includes a set of jewelry, a cabinet, and coinage minted during the tumultuous reign of this tragic queen. The items, like the events of Mary’s life, are indeed the stuff of legends, and the museum’s web site devotes several pages to this most famous of all Scots. Queen Mary’s motto, which she used as an embroidery motif during her captivity, was “in the end is my beginning.” This is indeed an apt epigraph for the queen, as her legacy is as controversial as the actions she may or may not have taken during her life. Was she the hapless victim of political intrigues? Or was she a willing participant in a dangerous game of thrones that she ultimately lost? We may never know the answer to that, but the facts remain to tantalize us with their ambiguity. Because of the imperial organization of Western Europe during the late Middle Ages and Renaissance period, Mary’s royal blood made her an important bargaining tool in the construction of alliances cemented by marriage. While Scotland was not a key player at the time, Mary was the grand-daughter of Henry VII of England and fourth in line for the English throne after her older cousin Elizabeth. In addition, as the daughter of Mary of Guise, she also had important ties to the throne of France, which called claims to English territory. At the time of Mary’s birth, the area around Calais in what is now France was part of England; by this time, the two countries had been wrangling over what belonged to whom for the better part of four centuries. Mary’s parentage gave her the potential to possibly unite three countries into a grand empire, and from her childhood on, she was surrounded by intrigue and subsequent scandal. Born on December 8, 1542, six days after the death of her father, James V of Scotland, Mary was immediately used as a pawn in the court chess game. Another James, the Duke of Arran, became her regent, to the fury of her mother, who instantaneously began maneuvering for power. When Arran arranged a marriage between the child Mary and Edward VII of England, Mary of Guise resisted this alliance, betrothing her daughter to the Dauphin of France instead. Outraged, Henry VIII of English attempted what was called the “Rough Wooing”, a series of brutal raids on various areas of Scotland to try and force the marriage, but to no avail; the child Mary was sent at the age of five to be raised in the French court. 1558 was an important year for both the younger Mary and for her cousin Elizabeth. On the 17th of November, Elizabeth became the Queen of an England marked by political upheaval. The country was still in the middle of the Reformation, and Elizabeth was only the third Protestant monarch in a country that had just recently been strongly Catholic. Moreover, she was a single woman at a time when men were expected to rule. For these reasons, Elizabeth never quite sat easy on the Tudor throne. Seven months earlier, her younger cousin Mary had married the futureFrancis II, the Dauphin of France, with the understanding that Scotland and France would eventually merge. Given Mary’s claim to the English throne, it is not surprising that Elizabeth immediately perceived her to be a threat. It’s unclear whether Mary’s ambitions included England at the time of her marriage to Francis. Raised as a proper French Catholic, she was a popular monarch when she became the French Queen the following year. Unfortunately, her husband died after two years as King. Her mother-in-law, Catherine de Medici, intent on furthering her own power, left Mary to an insignificant role as the widow of the former King. Her mother having died the year before, her only close relative was her half-brother James, who urged her to return to Scotland and rule there. Eventually, despite the warnings of those who believed that she would be in over her head, Mary chose to take his advice. She returned to a Scotland she barely remembered, one that had been much changed in her absence. John Knox, the firebrand follower of Luther and Calvin, had brought Scotland to a Protestant majority, and was dead set against the country being ruled by a Catholic. Nonetheless, he was beguiled by Mary’s beauty and charm. Her beauty, fashion sense, and sophisticated background helped her to temporarily win over Knox and the rest of the Scottish court, and her diplomatic advisor William Maitland helped her to rule well and with restraint. Unfortunately for Mary, this ability to charm would prove to be the key to her undoing. Unlike her cousin Elizabeth, Mary chose marriage rather than a life devoted to royal duties; this time around, she would make her own choice. Her favorite suitor, Henry Stuart, Lord Darnley, was handsome and delightful, but also vain, easily manipulated, self-centered, and unsuited for the dangerous realpolitik of the times. Mary was warned by her half-brother James, now the Earl of Moray, but to no avail; the headstrong queen was in love. The marriage, which took place in 1565, brought her once again to Elizabeth’s notice; himself a grandson of Henry VII, Darnley further strengthened Mary’s claim to the English throne. Mary and Moray quarreled over the marriage, leaving the Queen without Moray’s counsel. As usual, she found herself caught between various factions of the court. Furthermore, she was now saddled with a husband who turned out to be disloyally interested only in his own ambition. Alienated from good counsel, a pregnant Mary turned to her private secretary, David Rizzio. Originally from Piedmont, Italy, Rizzio was another devout Catholic in a country populated by increasingly intolerant Protestant nobles. Having convinced Darnley that Rizzio and Mary were having an affair, the group decided to remove him from the Queen’s influence. On the 9th of March, 1566, a group of conspirators burst into Mary’s private rooms, where she, Rizzio, and friends were enjoying supper. While Darnley restrained Mary, the others dragged Rizzio from the room, stabbing his body over fifty times before dumping it down a flight of stairs. Visitors to Holyroodhouse in Scotland can visit the scene of the murder in Mary’s Outer Chamber, where a blood stain allegedly still remains to underscore the brutality of the event. There is no doubt that Mary was traumatized by Rizzio’s murder, as the assassination once again left Mary bereft of counsel and searching for support during this latest wave of rebellion against Catholic rule. Now thoroughly alienated from Darnley, her actions in the following eleven months remain open to question and interpretation. The facts are simple: at this time, Mary increasingly turned to the attentions of James Hepburn, Earl of Bothwell and Lord Admiral of Scotland. She publically distanced herself from her increasingly dissolute husband, speaking of him with contempt. However, when Darnley took ill later that year, Mary arranged for him to recover at Kirk O’Field. On the 10th of February, 1567, an explosion blew up the castle there, and Darnley’s body was later found strangled on the premises. Court nobles saw this as a return volley in the escalating war between Mary and the rest of the Scottish court, and civil war broke out in Scotland. While Bothwell was definitely implicated in the murder of Lord Darnley, the extent of Mary’s complicity, if any, has been in question since the event. One Scottish lord, the Earl of Morton, claimed to have found missives written by Mary that proved her to be an active conspirator in the assassination. “The Casket Letters,” as they have become known, have been widely debated. Her supporters called them counterfeit; her detractors used them as proof of her guilt. In any event, Mary was taken captive by the Earl of Bothwell and held at Dunbar Castle. Mary married him not long afterwards; her reasoning in doing so remains unclear. Was she coerced into this bigamous relationship? Or did she see Bothwell as her only remained supporter? The pair raised an army to fight the other Scottish nobles, but were defeated at the Battle of Carberry on 15 June, 1567. Bothwell fled to Scandinavia, where he later died insane; Mary was imprisoned at Lochleven Castle. She escaped, raised yet another army, and was defeated once again, this time on 15 May, 1568, at the Battle of Langside, outside Glasgow. Escaping to England, she was taken into custody at Carlisle Castle. She would spend the next eighteen and a half years as a prisoner of the English court. In the intervening decade, Elizabeth I had claimed her own throne in an equally volatile environment. As a Protestant, she faced continual challenges from Catholics seeking to return England to ‘the true Church.’ The “Virgin Queen” used her status to show her loyalty to England and to play potential suitors against each other, but this strategy meant that there was no direct heir. Mary was kin and the next in line for the throne; to faithful Catholics, she presented a more valid claim to the English crown. As such, Mary’s status as a political prisoner would always be a ticking time bomb for the English queen. On the surface, Mary appeared docile and resigned to her fate; visitors to Holyroodhouse can see embroideries she finished while Elizabeth’s prisoner. Featuring a cat and a mouse, one of them seems to be an ironic comment on her status. However, which queen was the cat, which the mouse? Mary’s captors, the Earl of Shrewsbury and his wife Bess of Hardwick, considered her enough of a threat to continually move her from castle to castle. Mary lived in a gilded environment, but it was nonetheless a cage, and her supporters in the outside world remained determined to break her out. Over the years of her confinement, a number of plots were organized in her support from all over Europe. Pope Gregory XIII was only one political player working on her behalf; as the Reformation continued, she became a symbol of a hoped-for Catholic reclamation of northern Europe. Her complicity in any or all of these plots remains in question; Mary always protested her innocence and love for her cousin Elizabeth. One Anthony Babington would prove to be Mary’s final undoing. In 1586, communiqués written in code were intercepted by Elizabeth’s spies. These dispatches contained details of yet another plot to return England to Catholic rule through Mary’s ascension; they also included requests for Mary’s approval of the assassination of the Queen. Mary responded to the plans but denied the proposed murder; however, when this letter was intercepted, it was re-copied with a postscript that gave permission for Elizabeth’s death. Of course, Mary vehemently denied authorship of the postscript, but after two decades of subterfuge and danger, Elizabeth had had enough. On the 26th of September, 1586, Mary was moved to Fotheringay Castle and put on trial for treason; one month later, she was convicted. 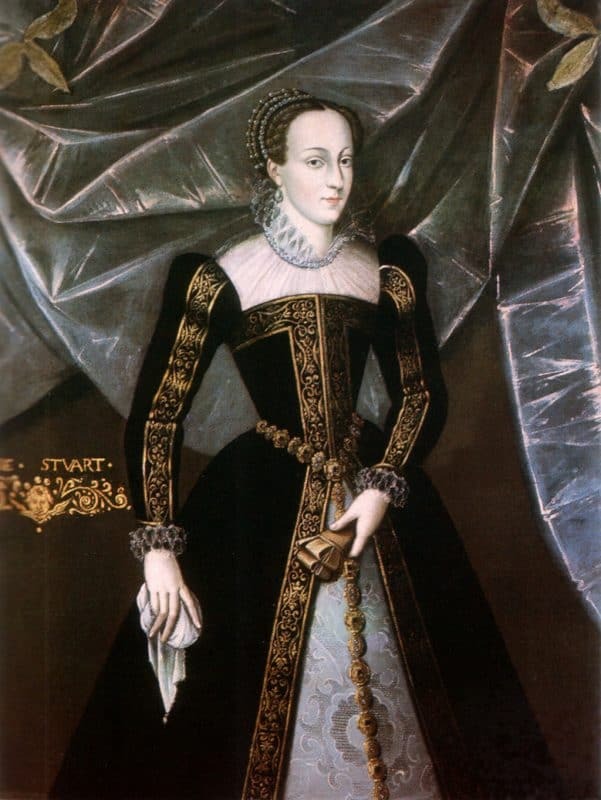 Elizabeth stalled for time but finally signed the death warrant on February 1, 1587. One week later, Mary, Queen of Scots, was beheaded. Has time vindicated Mary? All British monarchs after James have descended in some way from the Stewart line. Thus, it can be said that Mary, through her marriage to Lord Darnley, had a much greater effect on England and Scotland than did her far more successful cousin Elizabeth. To this day, her tumultuous life and tragic death continue to raise questions, intrigue readers, and provide reasons for travel to both England and Scotland. Intimately tied to both the Reformation and to the violent maneuverings of the Tudor line, she remains a legendary queen from a legendary time. After thirty years of teaching high school English like so many of my historical heroines, I too am pursuing a writing career. I am a yoga practitioner and RYT-200 (certified by Yoga Alliance); my writings on yoga, knitting, and California can be found on Bella OnLine. Besides my nonfiction writings, I am a short story author and poet. This is really helpful for me. I recently try to know this story and this article is really help me to know. Mary Queen of Scots is a tawdry soap opera that insists it’s an intelligent political thriller….